The connector, thumbwheel, jam-nut kit is designed to make throttle cable adjustment easier. This kit can be installed on CR through CD - 40, 45, 50, 55, 65 and 100 tiller steered models. Remove screw and spacer washer that secures throttle lever connector (A) to the spark control cam (B). Remove throttle lever connector from end of throttle cable (C). Before removing throttle cable connector, notice whether arm (D) is above or below throttle cable. Remove screw and spacer washer that secures throttle cable connector. Remove throttle cable connector from throttle cable. Insert thumbwheel into slot in throttle cable connector. Slide new throttle cable connector over throttle cable until it reaches the threaded area of the cable. Turn thumbwheel until throttle cable connector is centered on threaded area. Slide jam-nut (1) over throttle cable until it reaches threaded area of cable. Turn nut until threads are engaged. Do not tighten against throttle cable connector. On 2-cylinder models - place throttle cable connector (3) with thumbwheel (2) down. Install screw in mounting hole (E) on throttle cable connector. 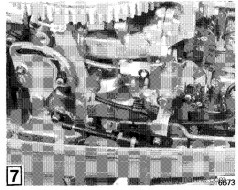 On 3-cylinder and V-4 models - place throttle cable connector (3) with thumbwheel (2) up. Install screw in mounting hole (F) in throttle cable connector. Install spacer washer between throttle cable connector and mounting boss. Tighten screw securely. Install throttle lever connector on end of throttle cable. Push screw through hole in throttle lever connector and install spacer washer. Tighten screw securely into spark control cam. Throttle cable adjustment can be made without removing the throttle cable connector. After adjustments are made, tighten jam-nut against throttle cable connector. Use the service manual for the model engine to be serviced. Check synchronization of engine before returning it to the customer.